On Easter weekend, it’s fitting that we have a holiday episode this week, even if that holiday is Christmas. 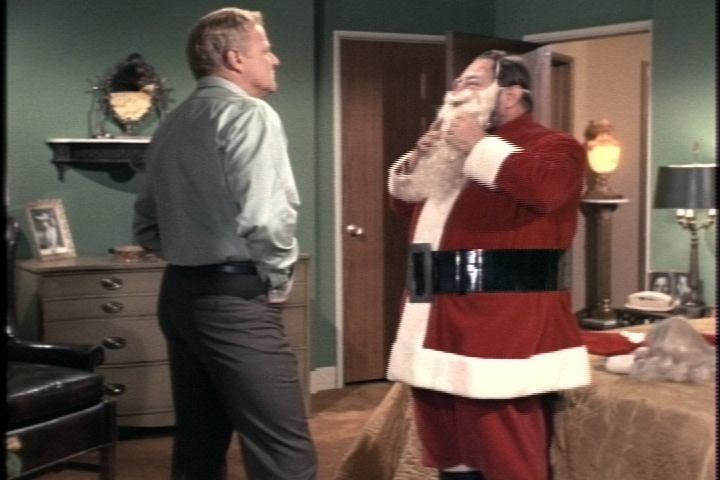 As the title and air date indicate, however, this isn’t exactly a Christmas episode. We begin in the classroom, where the twins are studying geography. Buffy can’t name the countries of Central America, though. Only one of Miss Cummings’ students can. 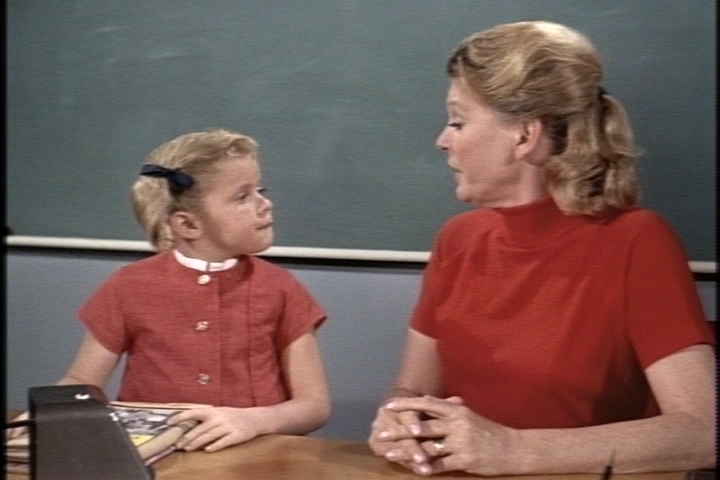 It’s the disembodied voice of Jan Brady! 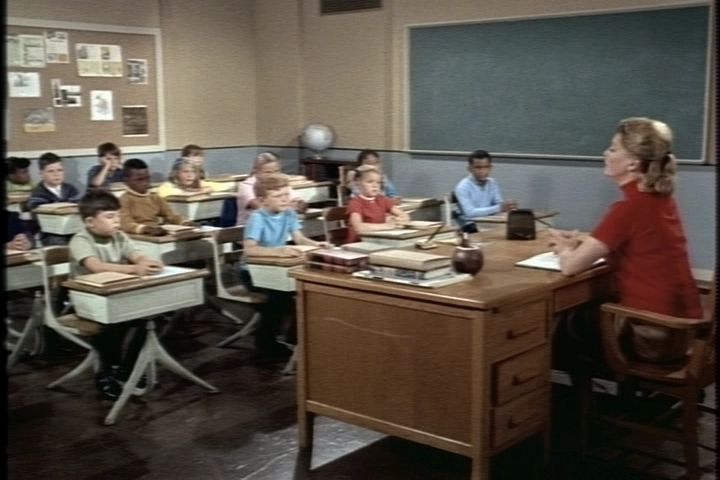 Actually, the student is Eve, a sickly child who’s sort of teleconferencing in from home. I wonder if any real schools actually offered this service. When I was growing up, kids who couldn’t come to school got “home-bound instruction” from a tutor. 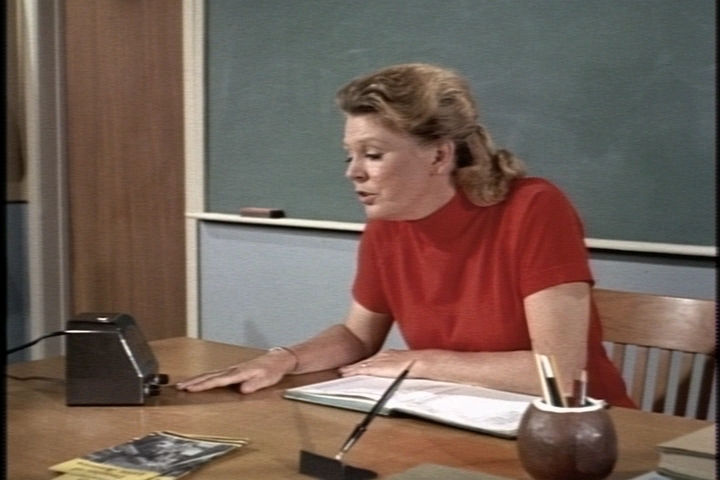 Later, Miss Cummings asks Buffy to stop by Eve’s apartment after school to drop off a new textbook. 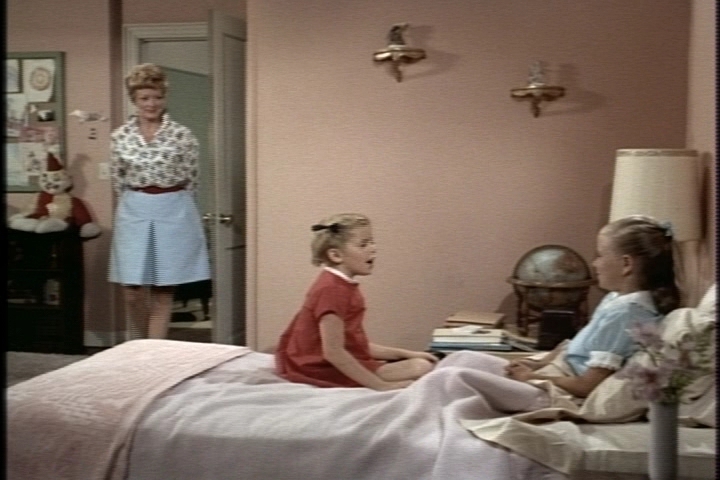 None of the kids have ever seen Eve, and Buffy is a bit reluctant to make her acquaintance. “It’s hard to like someone who knows all the answers,” she observes. When she actually meets Eve, though, she hits it off with her immediately. Eve’s sick room has the same creepy clown artwork as the hospital children’s ward we saw when Buffy had her tonsillectomy. Don’t sick children have enough to worry about?! 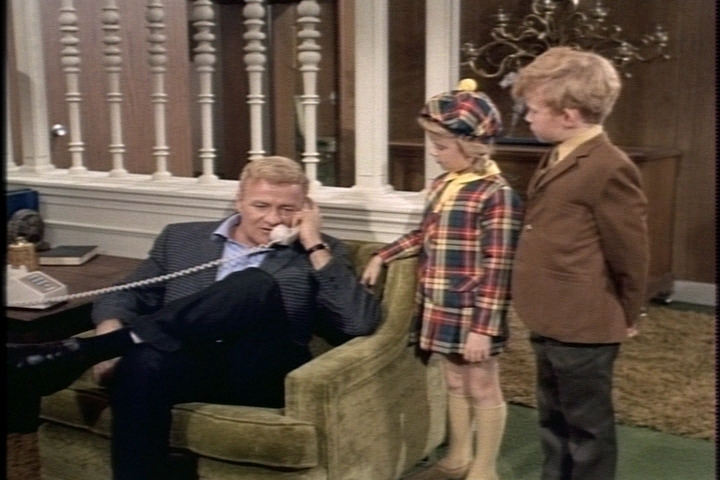 Buffy: Well, he’s not exactly our butler…and he’s not exactly our nanny… and he’s not exactly a relative. Eve: I don’t know who he is. Buffy: I still have to call him, whoever he is. The girls have fun playing word games, a favorite pastime for Eve. Though she looks fairly robust, she’s apparently too weak to get out of bed. 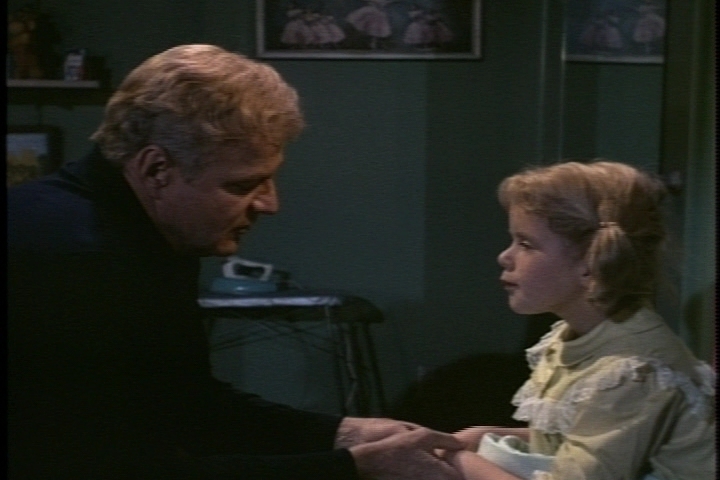 Eve says doctors haven’t been able to help her, but Buffy assures her that Uncle Bill can fix anything. Oh, dear. That night at dinner, she tells Bill about Eve and re-states her confidence in his ability to fix the situation. That earns a big sigh from Bill, who tries unsuccessfully to explain that some problems are beyond his capabilities. 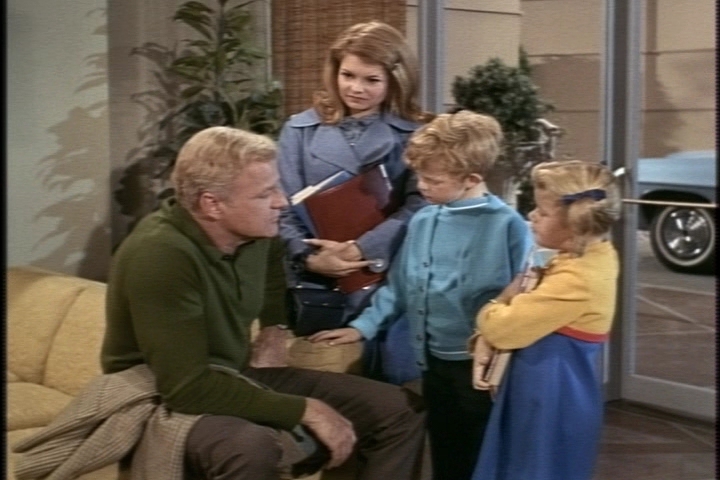 Some time later, Bill goes to the Bowers’ home to pick up Buffy and Jody, who have been playing with Eve. It’s an awkward moment when Mrs. Bowers describes how Buffy has been promising Eve that he could help. 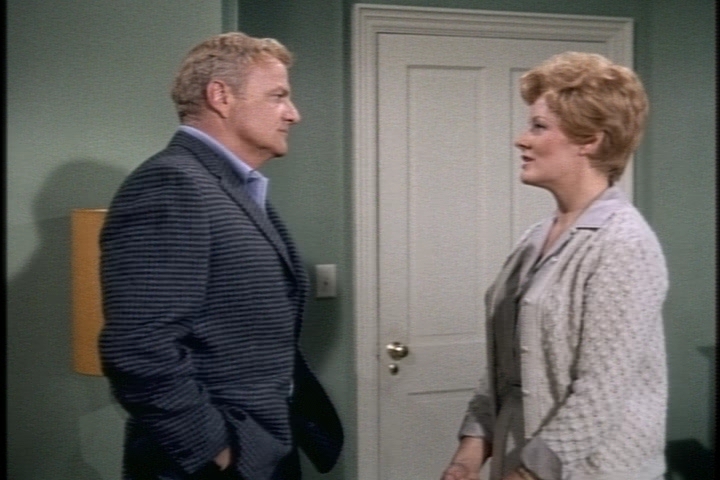 After meeting Eve, Bill goes above and beyond the call of duty by arranging for an eminent physician he knows to examine her. He even tells the doctor to bill him, while explaining to the Bowers family that a research foundation will pick up the cost. Random fashion note: Nice tam, Buffy. 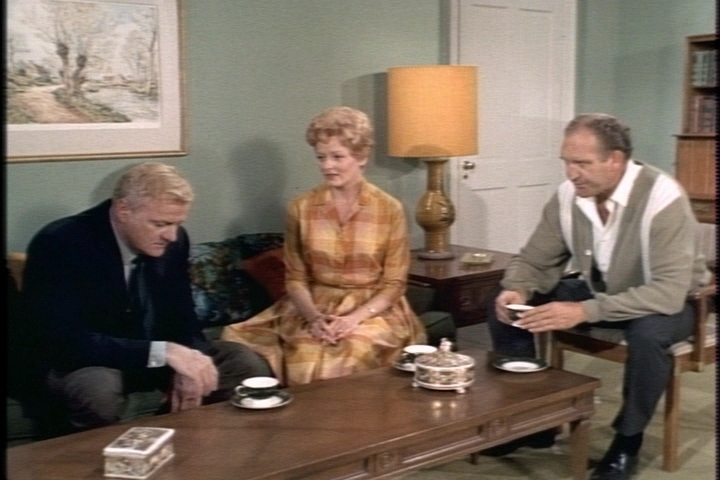 Mr. and Mrs Bowers tell Bill that his efforts have given them renewed hope. “To have a little hope again is a wonderful thing,” Mr. Bowers says. Unfortunately, that hope doesn’t last long. Wait, Eve has been at the hospital having medical tests while her parents chat with Bill? And a doctor and a nurse brought her home? That’s odd. 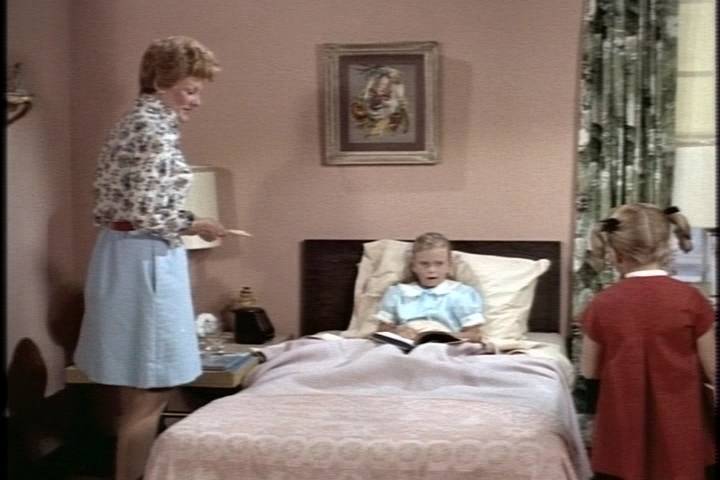 As the nurse takes Eve to her room, a grim-faced Dr. Flanders delivers the bad news. “I wish you could tell you what you want to hear,” he says. When Mr. Bowers asks, “How long?” the doctor has no real answer. Eve’s decline from her unspecified illness is a rapid one, however. 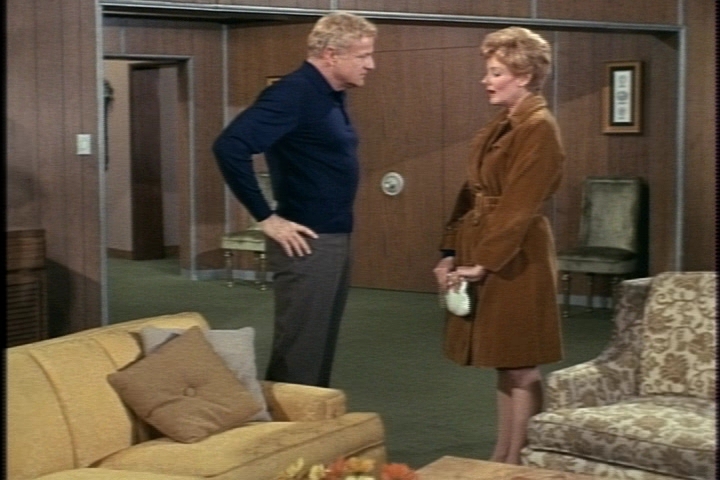 One night, Mrs. Bowers drops by the Davis apartment to tell Bill that Buffy should probably stop visiting Eve. Her daughter has grown “noticeably weaker,” Mrs. Bowers says, implying that the end is near. She thinks stopping the visits will make the situation less traumatic for Buffy. Bill is moved that Mrs. Bowers is thinking about Buffy’s feelings. He tries to explain to Buffy that Eve may be too tired to play anymore. Buffy argues that Eve needs a good friend now more than ever. “She would still come and visit me,” Buffy says. Bill agrees that the friendship can continue. One afternoon, when the kids return home from school, Bill makes a surprise announcement: They are going Christmas shopping. The kids are, indeed, surprised, since it’s not particularly close to Christmas. Bill says an upcoming work project might take him to South America, and he won’t make it home in time for Christmas. He wants to celebrate early. He tells Buffy that they should include Eve in the party, and since Eve can’t leave her apartment, they will have the party there. 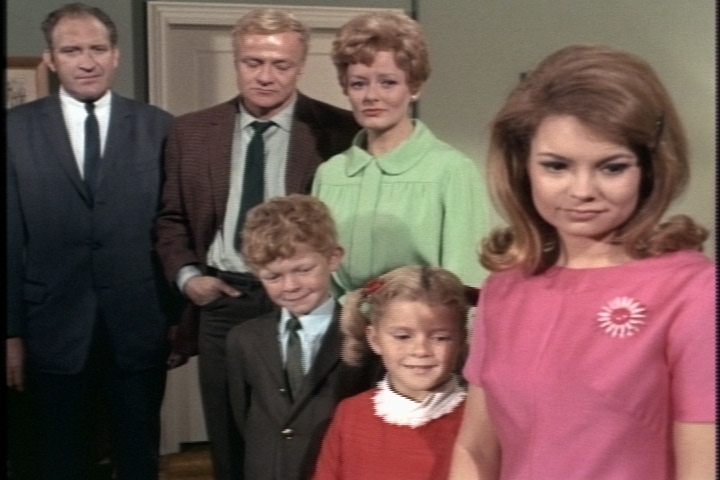 Cissy’s expression shows that she understands what’s really going on, but the twins seem to buy Bill’s story. Soon the whole family is trimming a tree at the Bowers apartment. Eve says it’s the most beautiful tree she’s ever seen. She’s seen some pretty ugly trees, I guess. 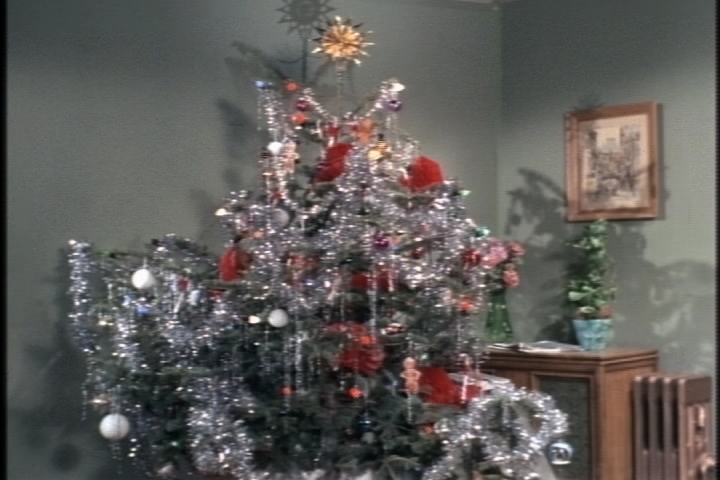 Jody thinks the tree look terrible–because it has no presents under it. 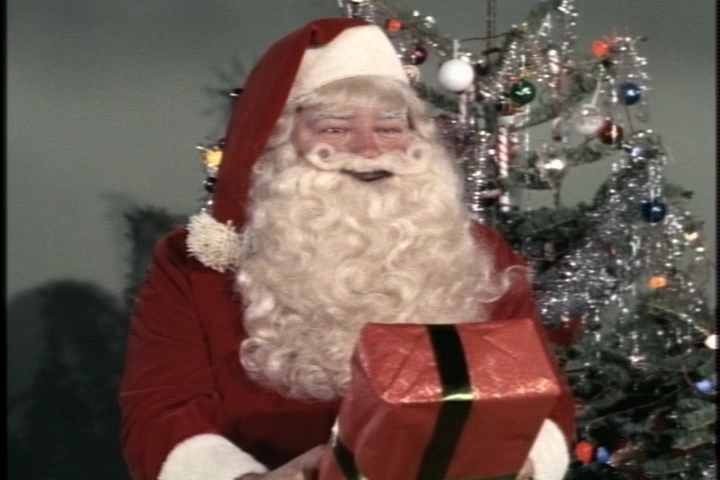 That’s the cue for this strangely familiar Santa Claus to arrive. He gives Eve a doll that delights her. The adults look on sadly, but the children seem oblivious. When the Davises get home, and the kids are in bed, Bill helps French de-Santa-fy himself. 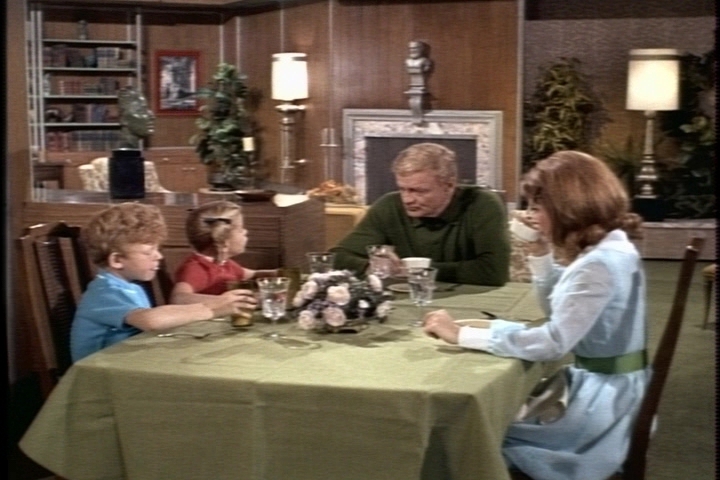 They express relief that Buffy and Jody are too young to understand the real reason for the early celebration. But when Bill goes out into the hallway, he hears sobs coming from the girls’ room. The episode ends with Bill embracing Buffy, who obviously knew the truth all along. This episode is difficult for me to evaluate. The story idea is rather maudlin, and it is handled in a superficial way that doesn’t generate much real emotion in the viewer. On the other hand, it is so very Family Affair. Can you imagine any other sitcom from the same era telling this story? Especially in a (sort of) Christmas episode?! I like the fact that the dialog is subtle; the episode conveys Eve’s fate through knowing glances and awkward pauses. 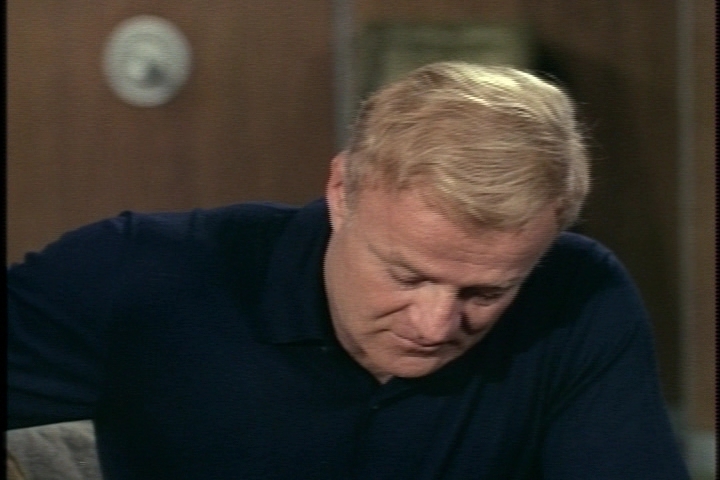 I can’t help wondering how Brian Keith, who had lost a young son, felt about this episode’s subject. Eve Bowers: Eve Plumb. Miss Cummings: Joan Vohs. Mrs. Bowers: Ann McCrea. Dr. Flanders: Ivan Bonar. Mr. Bowers: Paul Sorensen. 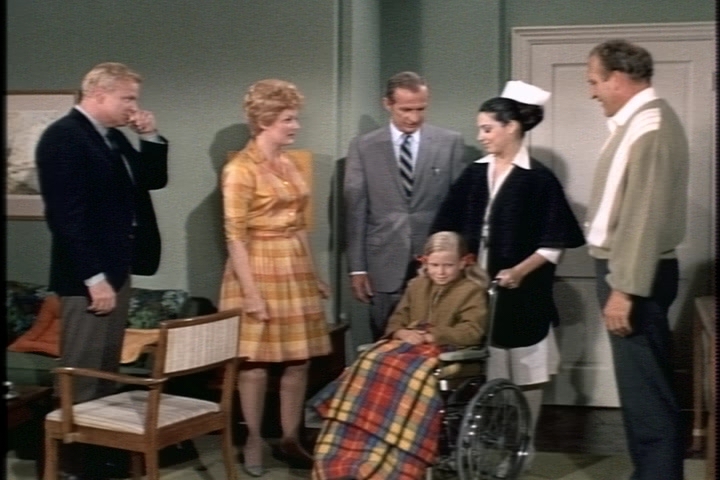 All the other guest actors are Family Affair “repeat offenders,” except Paul Sorensen. Late in his career, he had a recurring role in Dallas as Andy Bradley.